This post will show how to open a scad file, customize it, save it to stl files to be printed on a 3D printer. 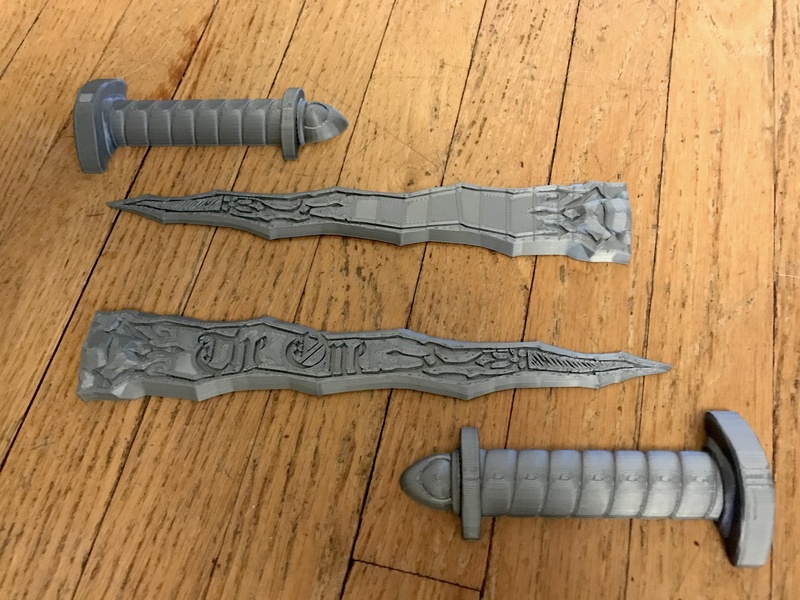 Specifically, I will take a solid 3D scad model of a dagger and turn it into 4 pieces, top and bottom of the blade, and top and bottom of the hilt, so that it can fit the print bed of my Prusa i3 MK2S. First, some background. I follow @joeltelling, the self described 3d printing nerd on twitter. He linked to a video he made with a cosplayer, Kato, where they 3d print a dagger. He links to the dagger in the description of the video, and I thought, cool, I haven’t tried to print a dagger, I should do that. So, I head over to Thingiverse to download the Dark One Dagger. That is a picture of a painted version at the top by the dagger’s creator (I think). It looks pretty cool. I downloaded the files, went to pull them into my slicer, and… wait….what the heck is a .scad file? I haven’t been 3D printing for very long. I just got my Prusa MK2S printer this fall. I had only downloaded .stl files from Thingiverse, so I was a bit confused. I looked around the internet for a converter, but it looked like the best was was going to be to use the program OpenSCAD. Oh great, another 3D tool to learn. Turns out, it wasn’t that hard. Head to the OpenScad website, and download a version for your OS. I go the OSX version. Now, a bit of a weird thing happened – it was in French. I still haven’t figured out how to select a different language, or download a different language. Oops. I still figured it out. So after installing OpenScad, open the program. I guessed correctly that using the menu, Fichier / Ouvir … was the File / Open … dialog. I selected the scad file, and brought it in. Now, OpenSCAD is a bid different program. It contains the data for an object as a program. 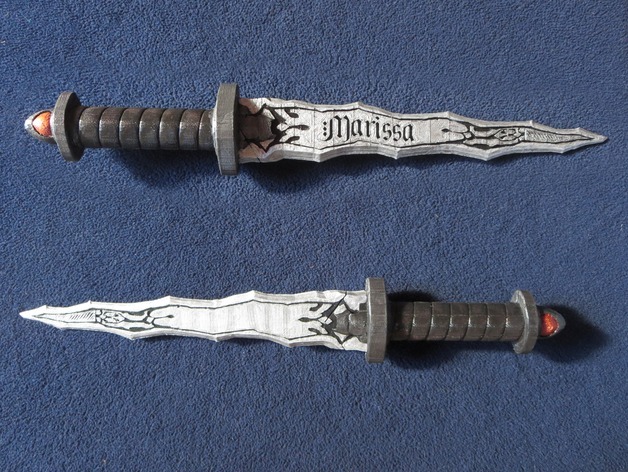 This is why this model on Thingiverse is able to be customized, such as the text on the blade. We can make these modifications right in the code! Here is a screen shot of part of the program screen. If you look on the left, there is a variable called name that has a value of “The One”. It was “Melissa” when I opened the file. I changed it to print “The One” on the handle. I changed a couple of other numbers too, multiple_parts, and part, but not until I had tried the default values of 0, and 1. With the original values, and the whole dagger showing, I went straight to trying to create a stl. I used the menu Fichier / Exporter / Exporter comme STL… However, I got the message that the dagger wasn’t rendered yet. I first had to do that with Menu Conception / Rendu, or F6. This took awhile. After this, I was able to bring export it as an stl. I then opened it in the program Slic3r. This is an open source slicer. I have a version that came with my Prusa printer. You can use a different one, but I did use a feature called cut that I will talk about shortly. So, now I had the model open in Slic3er. The whole dagger. Hmmm. This won’t print well. I ran into two problems with this render. 1st, it was too big for the print bed. 2nd, it was going to have a ton of support material if I did it this way. I had expected it to be in 4 pieces, like in the video I had watched. It was split into top and bottom of the blade, and top and bottom of the hilt. Hmm… I did find an option called cut in Slic3r. This let me cut the dagger into two through the z-axis, which made two parts that could print flat, but it was still too big for the bed. Back to OpenSCAD. Ok. The goal is to get 4 pieces that can print flat, and when arranged will fit on my print bed. I looked through the top of the code in the left panel and saw the two variables I mentioned earlier, multiple_parts, and part. After some experimentation, I found that if I opted to pick multiple_parts = 2, as the comment indicated, it would render the hilt and blade separately. So set the multiple_parts = 2, and part = 1. Press F6. That will render the blade as one piece. Export the stl file of the blade. Then change the variable part = 2. This will render the hilt as one piece. Export the stl file of the hilt. If you are so inclined, you could edit the code further to render each of the 4 parts separately but I figured I would just use the Slic3r cut function. I then opened Slic3r again. I added the two stl files to the platter. Then select one of the pieces such as the blade, and use menu item Object / Cut… You can then set the z-axis point where you want to cut. I chose 1/2 of the height of the blade. 16.68 / 2 = 8.34. After you hit the Perform cut button, you will have two parts of the blade, the top, and bottom. Then do the same with the hilt. It has a height of 32.88. So open the cut dialog and enter the z value of 32.88 / 2 = 16.44. So, now you should have 4 pieces laying flat on the plater. I rotated and moved them around a bit so that I would have this. We now have what we wanted. We have tops and bottms of both the hilt and the blade. They are lying flat on the bed, so there will be no supports needed. You can now sliced the model and generate the gcode. 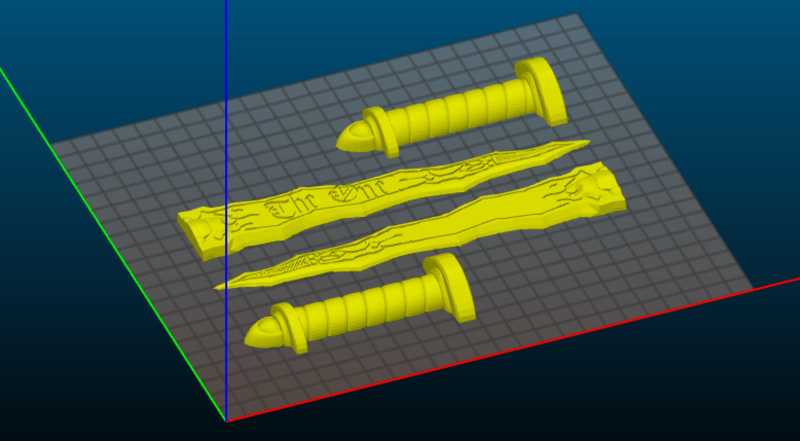 Put the gcode on your printer, and it will print all 4 pieces. When you are done, you can use crazy glue to put them together. I was in too much of a hurry to see the print off the bed, that I forgot to take a picture. Here is one I just took. If you look close, the blade seems pretty rough to me. I printed it with the default ‘optimal’ setting on the Slic3r. I am currently printing the blade again with the fine setting. I hope this helps and your dagger (or what ever you had) turns out well. 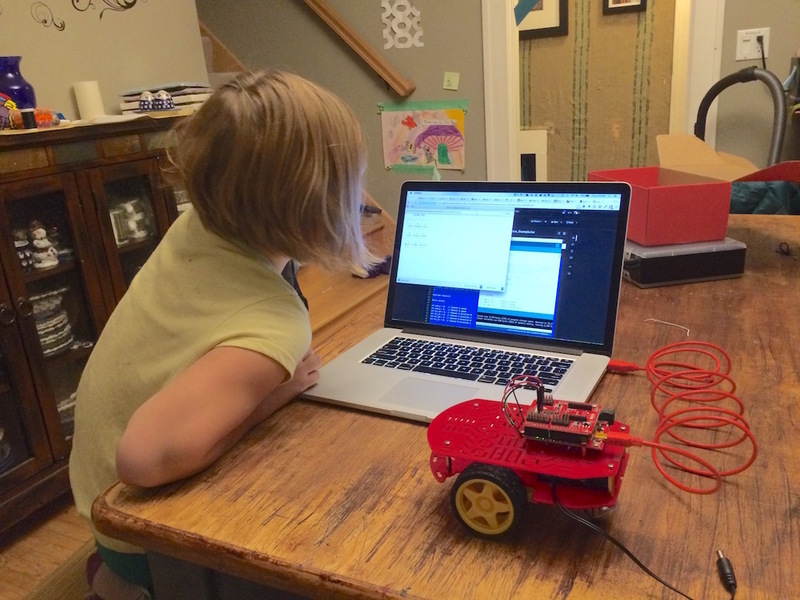 I decided that I wanted to build a robot, and build one with my daughter who is about to turn 9. I have plans in my head for the most amazing robot ever, but I figured we should start with something a little simpler and smaller. First up, what to build? 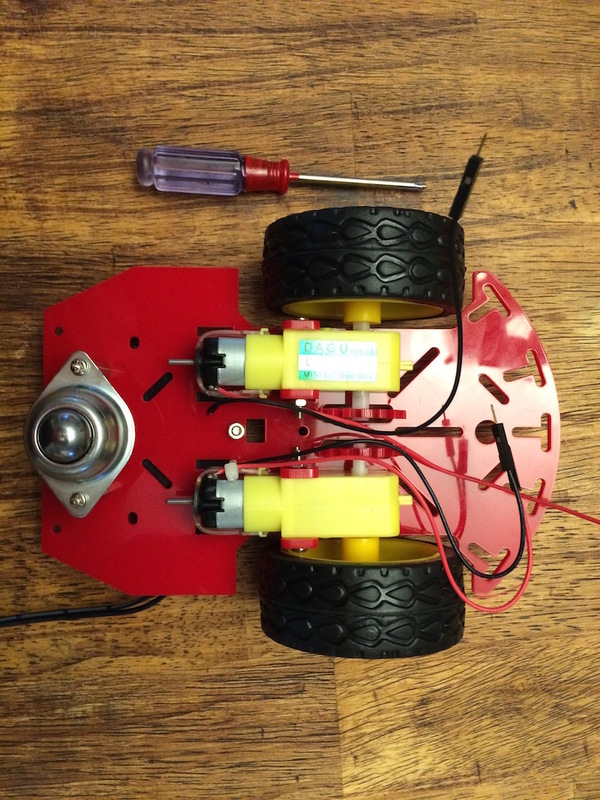 After a bit of research, I decided that a 2 wheel drive and a caster for a third wheel was the way to go for our first robot. Next, I needed a frame. I read a bit about building my own with metal, or wood, or cardboard, or coroplast, but I thought that I wanted to go with a purchased frame. I figured that a plastic frame would be sturdy enough, more durable than cardboard, and would not scare off my daughter. They can really be pricey. What I settled on, due to price was the ‘old’ frame that Sparkfun used to base their basic robot off of. I found it at the Robot Shop. This kit came with a two tier frame, two motors, two wheels, the caster, and a battery holder for $15. My kinda deal. This is what the kit looks like, putting the motors on the bottom. The motors sit under the lower deck. This chassis is a two tier design. Their design places the battery pack in the middle. 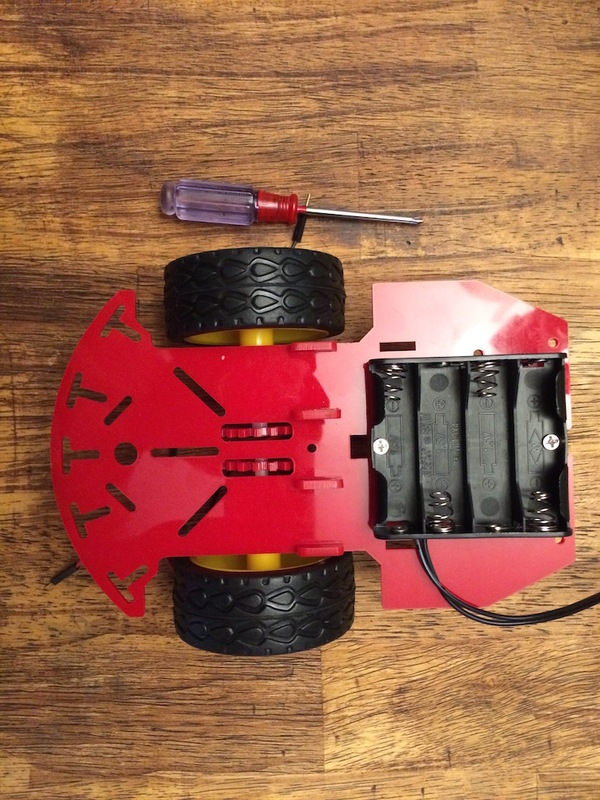 Note: for this phase of the project, with the robot connected via USB cable, the battery pack is not needed. But, if we didn’t put it in now, it would be really hard later. The battery pack sits on the top of the lower deck. The whole thing goes together pretty easily. There are screws and standoffs included with some ok but not great instructions. Still, Lily managed to put most of it together with some guidance. Next up was the brains. I didn’t want to buy an entire kit. 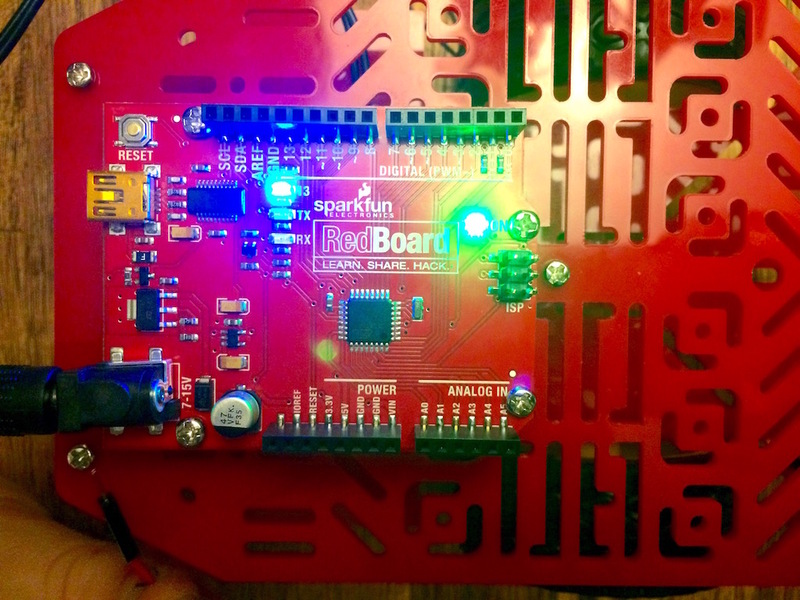 For example the RedBot Basic Kit that SparkFun sells is $84. Two issues for me. First was that the kit relies on a single purpose built board for everything. I wanted more flexibility. I didn’t want a micro-controller and the motor controller, and the sensors all contained in the same silicon. I wanted more reuse. Second, I wanted more input into this. I didn’t just want a step by step kit. I wanted to still keep things simple, but with some stuff that I purchased separately. This also allows us to build it in separate stages. 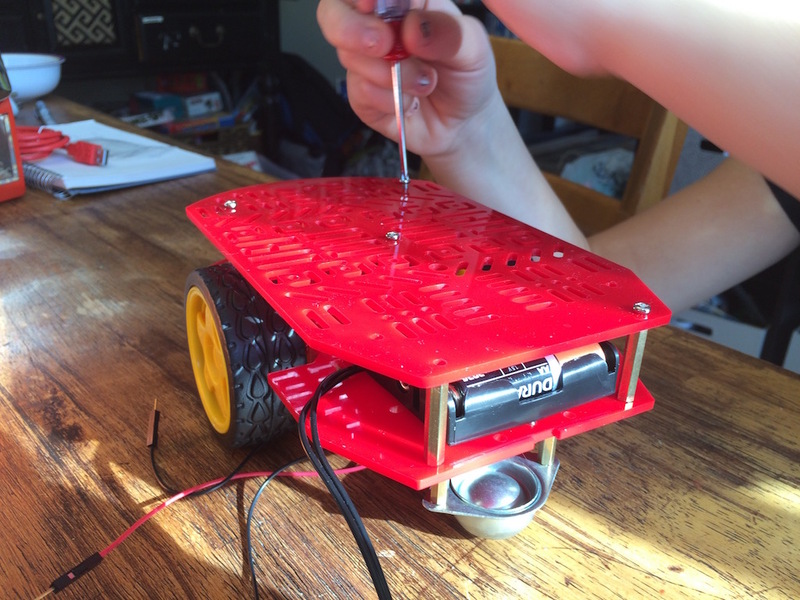 After the chassis was built, I said to Lily, “now what?” We decided that it needed a brain. She thought that one just like we were already using (an Arduino Red Board) would be a good idea. Instead of using the one we had, I placed an order for another of these $20 boards. It took us awhile to figure out a good way to mount it to the top. We couldn’t find a pattern of holes that fit exactly. We did have some extra short standoffs from the chassis kit, and were able to use these. We managed to attach the screws to the Red Board and the chassis at 3 points of contact. The one at the top near the headers is just connected to the board. I also ordered a motor controller shield. I thought quite awhile on what to get here. In the end, I decided that a shield would make this much simpler and have less wires going all over. 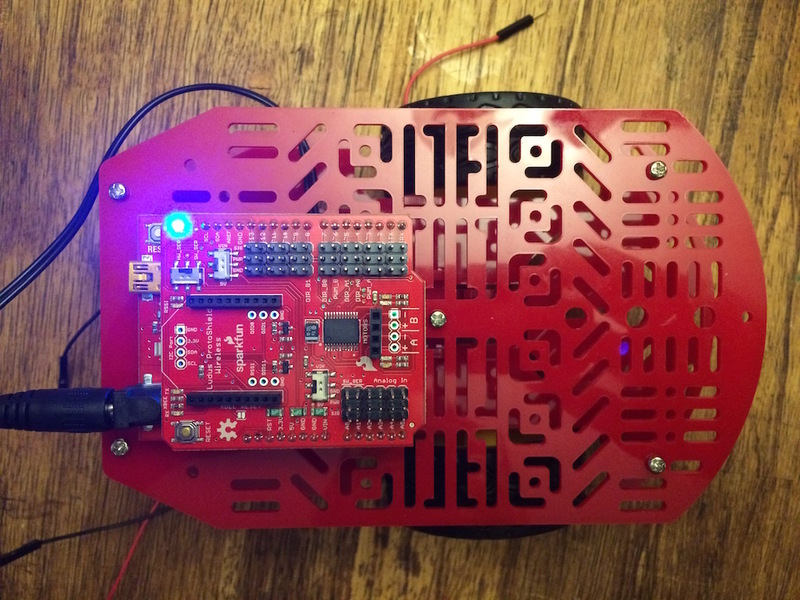 I purchased a Ludus Prototype Shield from SparkFun. At a whopping $25 this was the most expensive part. It does have an interesting trick. 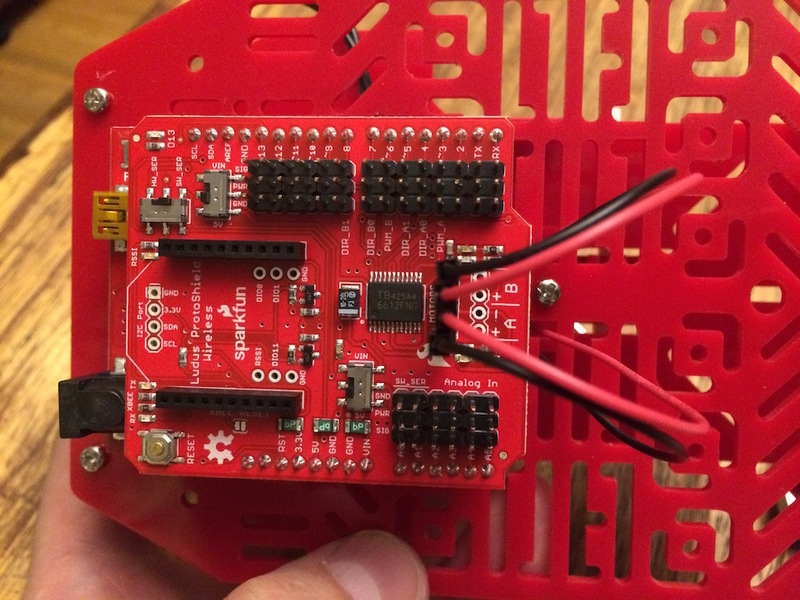 This version of the board supports plugging in an XBee. I think that taking this robot wireless eventually will be a big draw for my daughter in the near future. In this next image, you can see that I pushed the wires up from the bottom, and plugged them in. Actually we plugged them in wrong. If you look closely you can see that the + and – signs aren’t lined up with the black and red wires properly. We got our first chance to debug our hardware once the software had been loaded. 😉 But that’s it. Just a few wires to connect the motors, and we have the first iteration of our robot. Now for some brains. 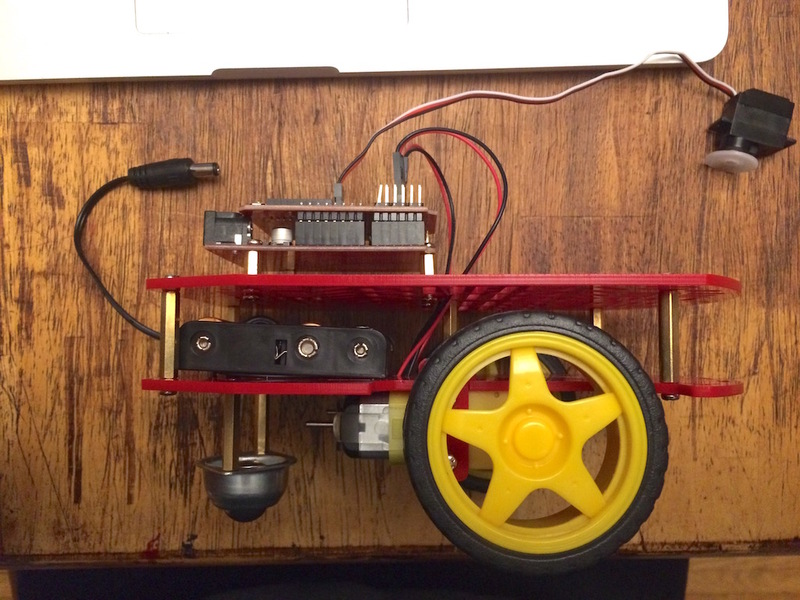 To start with, to get it running quickly so Lily could see some progress, we used a sketch that SparkFun wrote. They have a whole tutorial on the Ludus Controller. This is one reason that I purchase from companies like SparkFun and Adafruit in the United States. There are often cheaper places to source some of these parts, but I like to support the companies that are creating tutorials, and supporting their customers on their forums /rant. Anyway…. Using the Arduino IDE, I copied the sketch from SparkFun (I grabbed the entire thing from GitHub) and pasted it into a new sketch. 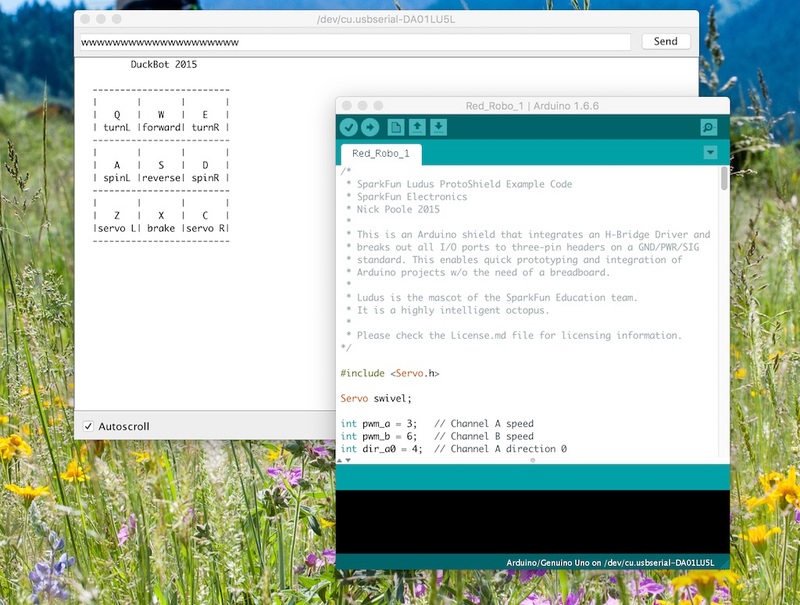 After setting the correct board type (Arduino Uno) and a baud rate of 9600, I uploaded the sketch with no problems. This particular sketch uses the serial monitor built into the IDE to send command to the robot over the USB cable. What’s cool is that we can just type in a few letters into the console and send these commands to the robot over a USB cable, and the robot moves. That was pretty exciting. Here is Lily entering some commands to move the robot on the table. Phase one complete. Chassis built, check. A micro-controller with a motor shield, check. A program to move the robot across the table, check. 8 year old excited to be a maker, check. Lily doesn’t like the USB cable. She wants it to move on the floor. I think that might be the next step. I had created a wedding album, and the parents of the bride had purchased their copy. The parents of the groom had some changes they wanted to make. There were a few pages, like the one above that they wanted as is, there were a couple of pages that they didn’t want, and several pages that they were hoping to swap a few images. They did live close by, so I headed over to their house with just my iPad. Yup, just my iPad. I wanted to be able to sit side by side with them and draw right on the pages of the electronic book. Best case would be to be able to drag the images around, but that wasn’t going to happen. I would settle to being able to pen in new numbers and draw arrows for moving images around. To accomplish this, I used two apps. The first was Penultimate. I used this app with a digital pen to draw on. I created a notebook for this project with the amazing title of Album Notes. I then, page by page inserted a page spread from my album (exported previously) into the notebook. I now had images that I could draw on. I also used the Zenfolio app. 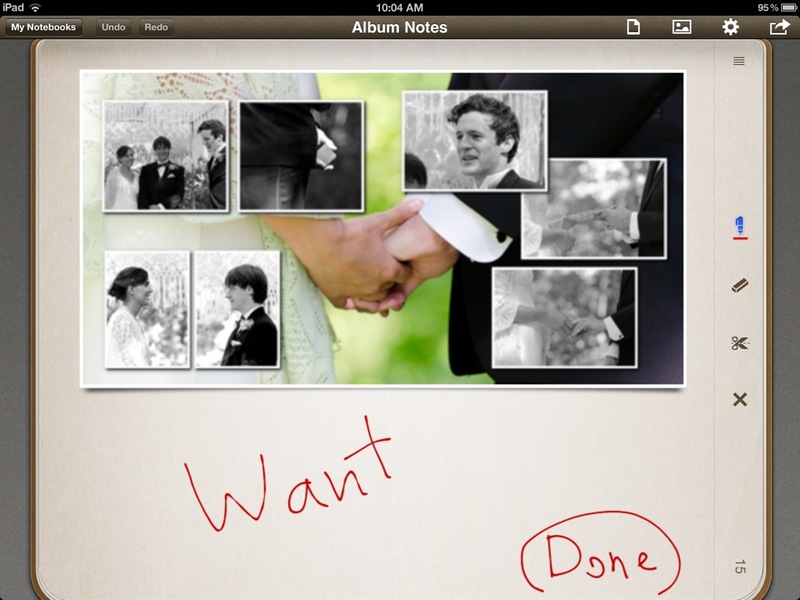 I used it to move copies of all the wedding images I had online to my iPad. One thing that doing this did was keep the image numbers in sync with what the mother of the groom saw on the website, and meant that I didn’t need a wifi signal. One wish I had was that images that she had picked as favorites could have been synced to the app. She had selected and favorited the images she likely wanted to put in the album on the zenfolio website. If those could have been synced it would have made the process easier as well. This was the process we went through. First I went through and marked with a big red X all the pages that we were going to get rid of, and ‘want’ on the pages we were keeping without changes. When we found a page that had images that we wanted to swap, we would put an X over the image, and come back to it later. After this we had a count of the total pages we would have, and a count of the number of images we needed. 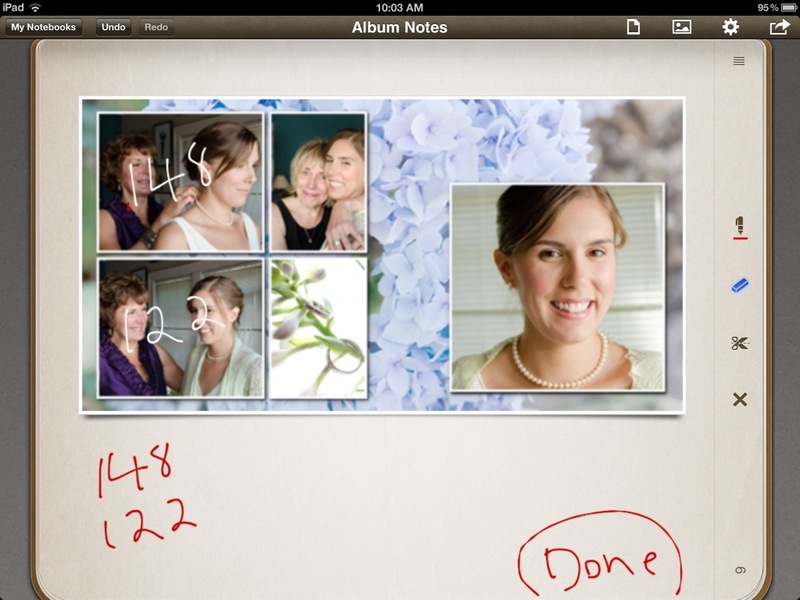 Then, we would go over to the Zenfolio app, pick some appropriate pictures, come back to Penultimate, and pen them in. As pages were finished, I would mark them as done, so we could identify what pages we needed to work on still. One of the things that worked well was having a special wacom bamboo pen to write the numbers with. Much better than writing with your finger. One thing that was frustrating was that you can’t swipe back and forth on Penultimate. I needed to go back to the TOC, and then pick the page I wanted. You can press the page number in the lower right, but that just goes in one direction, and I constantly needed to go back. Penultimate also doesn’t like to be sideways like this. 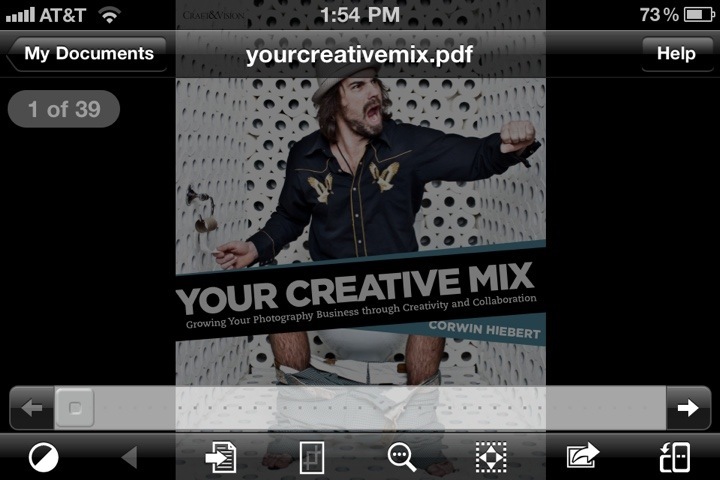 I would sometimes get my images upside down, and have to turn and twist the iPad until the image was the right way. It was also slow. I was doing this on the 1st generation iPad, and it quickly pushed my decision to buying a newer version. When I tried this with an iPad 3, it was like night and day. It went from frustratingly slow to just as responsive as you would expect. 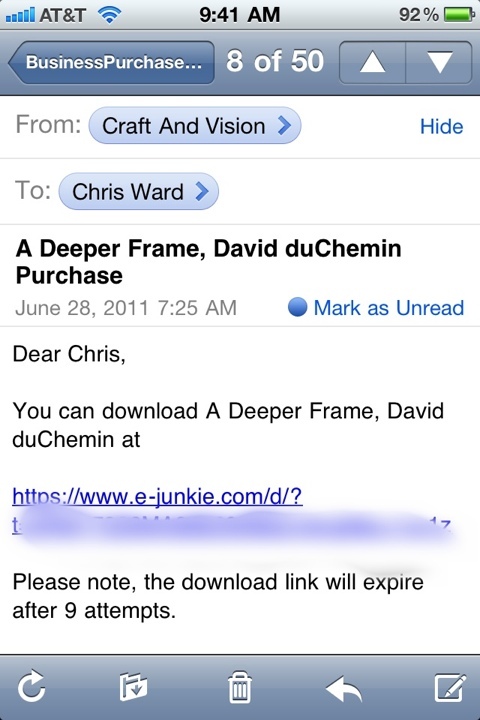 I suppose that I could use a tool that exports my album as a PDF, then use a PDF tool that can annotate a PDF. My pages were exported as individual JPEG’s, so that wasn’t a great options when I was short on time, but might be something I try on a different occasion. I started posting some images from Nepal the other day, and I will get back to more of those, but I felt like getting some of my image from India up first. They are all from Old Delhi. The person above is a chai tea brewer. 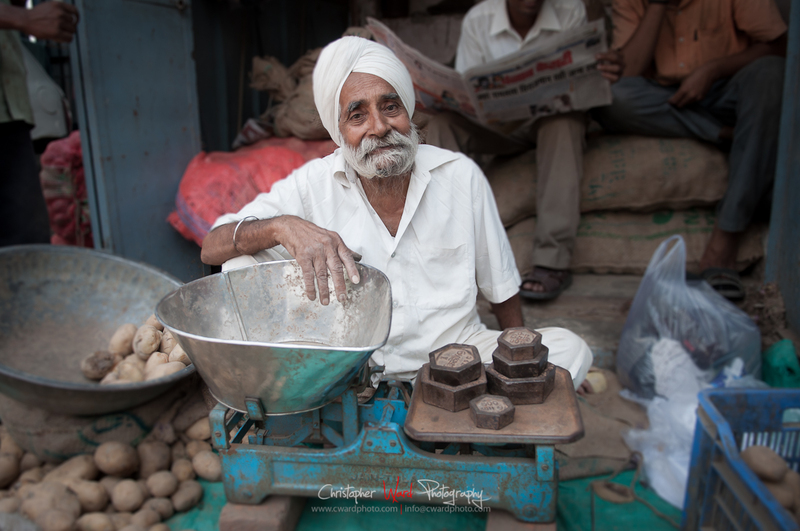 He has a stall in a little market at the edge of a city dump in Chandni Chowk. As is typical of theses guys, he was outgoing, and gracious enough to let me take his picture. He was very excited that I would buy a chai from him. One of the best I have had, but I had to not pay attention to the cleanliness of the glass. I found this gentleman next to the Chai stand. He was eying me very suspiciously. 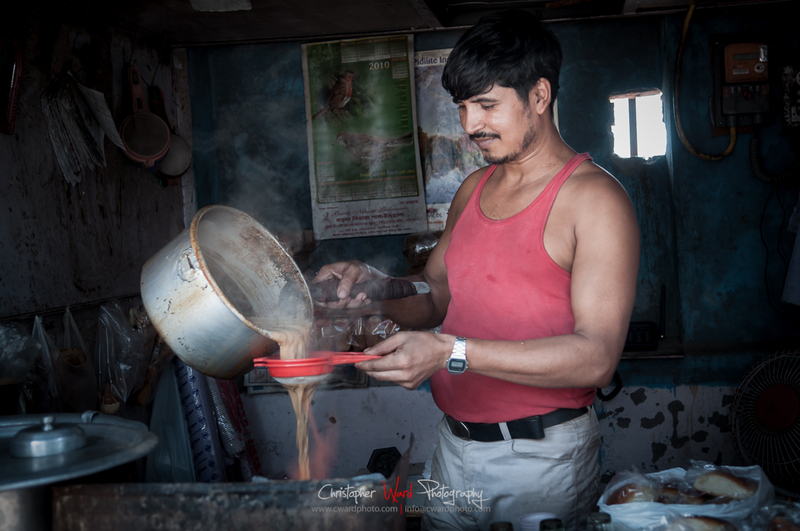 I hung out at the Chai stand for a while, before coming back and asking if I could take his picture. I smiled, and nodded to my camera, and he did the same. Suspicion mitigated. This picture was taken in October 2010, and yet I am just finally getting to posting these images to the web. Not only this, but this is the first image I have processed in Lightroom 4 and posted to the internet. Woo hoo. Anyway, it has been a long time since I have been in Nepal, and I can’t believe I haven’t managed to get to processing my images. Never mind that this image, and the next several that I will post I already processed while I was in Nepal. 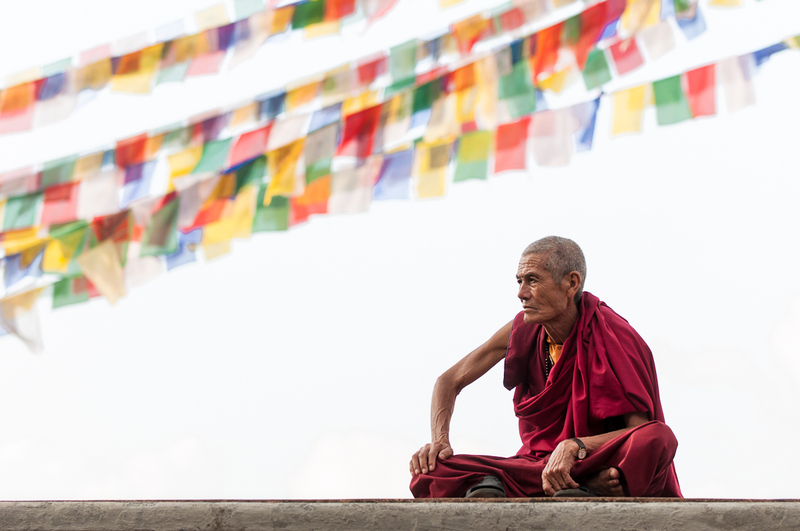 I was in Kathmandu, walking around the Boudhanath Stupa. I looked up and saw this monk. He was sitting at mid level of the Boudha Stupa overlooking the people below. I pulled out my 200mm lens, and took a few pictures before he noticed me. I felt I got a fairly stern look. I then whet up and showed him the back of my camera. He gave me the biggest smile. 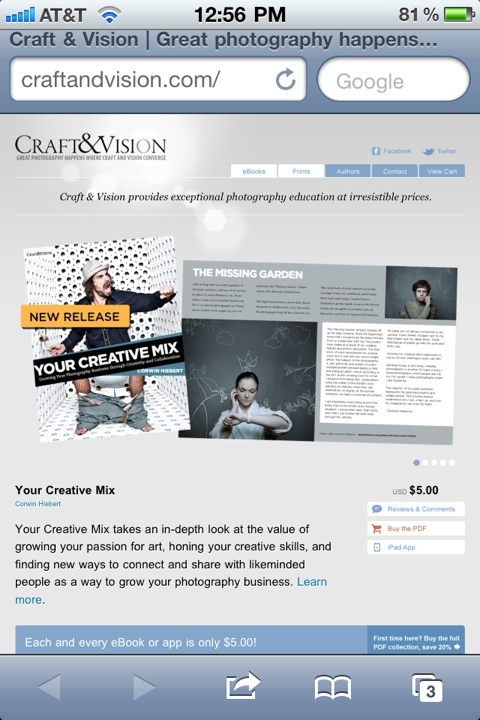 Ever been out with an iPhone or iPad and Craft&Vision has released a new ebook that just have to read right now, but you are not at a computer? Well, there is a way to download directly to your device. It is possible that the concept if not the exact method would work on an android. I don’t know the software on that platform. The first thing you need to do is purchase an ebook. The site as it is currently is quite navigable by a mobile device. It isn’t optimized for mobile, but with a little pinching and moving around it is possible to follow the checkout process through e-junkie and PayPal and buy an ebook. This part of our exercise you could do from another computer somewhere if you have access. Just erase cookies when you are done if it’s a public machine. 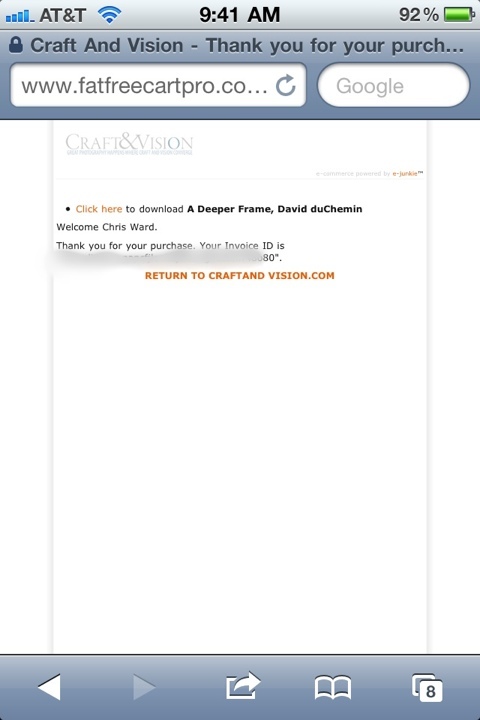 Once you have made your purchase, you will get an email from Craft and Vision. Check for it on your mobile device email client. Click the e-junkie link. This takes you to a page on fat free cart’s site. This is where the PDF is stored, and the link on this page contains the unique code that allows you to download the PDF. Now don’t worry. You get s very generous 9 attempts, so you can re-download at home if you want. Press and hold for a second the “Click Here” link. This will bring up an option to copy the link. Press that button. Safari won’t let you save the PDF if you were to just open it. We need another program. My favorite PDF tool is GoodReader. Navigate back to the main screen shown here if you had a doc open. There is an option for “Web Downloads”. Press that. 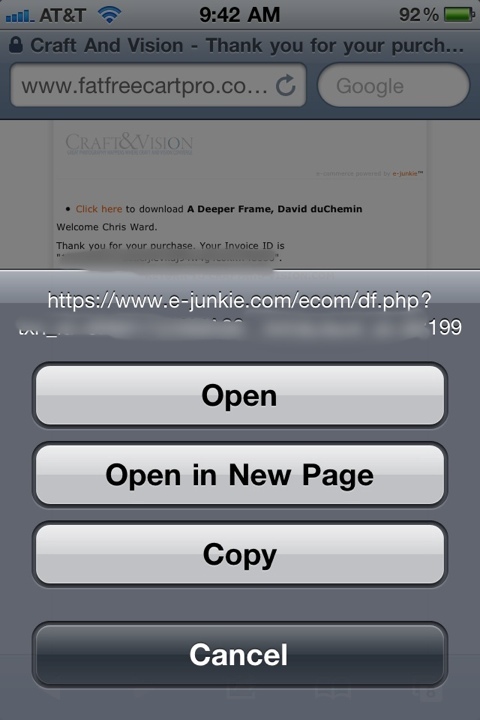 In the next screen press the “Enter URL” link. 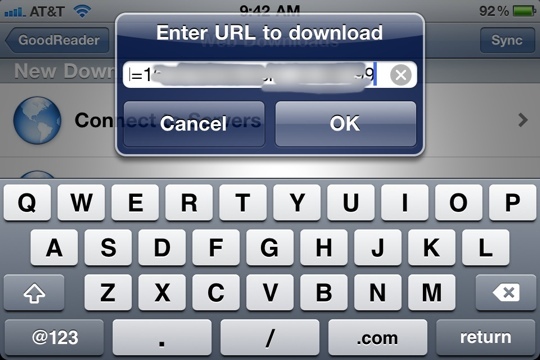 In the screen that pops up, tap and hold a second to get the iOS popup that let’s you paste in the URL you copied. 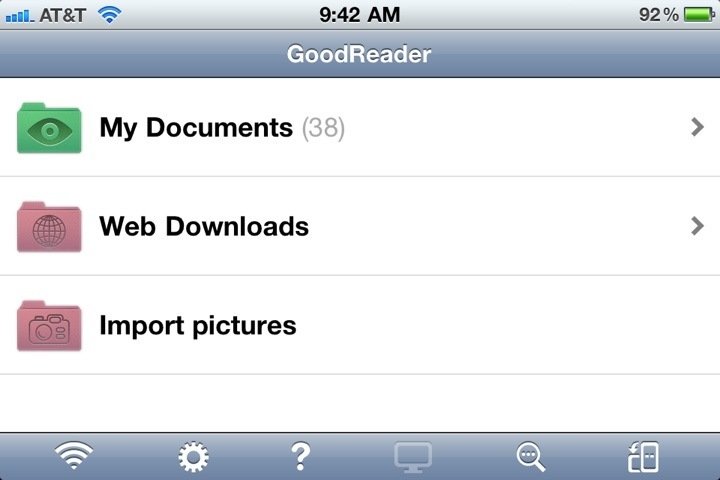 GoodReader will download it to your device and you can read it right away! Enjoy your PDF’s on your iOS device without your computer. PS. This post’s images were taken on an iPhone4. 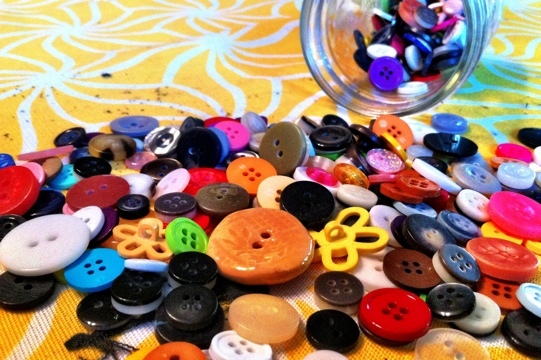 Parts blurred using filterstorm, and uploaded and the post started using the wordpress app. I finished it by moving the images into place in the regular wordpress interface.